Asus has announced a new addition to their range of convertible notebooks with the launch of the Asus VivoBook Flip 12 which comes equipped with an 11.6-inch touchscreen display providing users with a resolution of 1366 x 768 pixels. As with all convertible notebooks the keyboard can be swivelled to the rear of the device to transform it into a tablet when required. 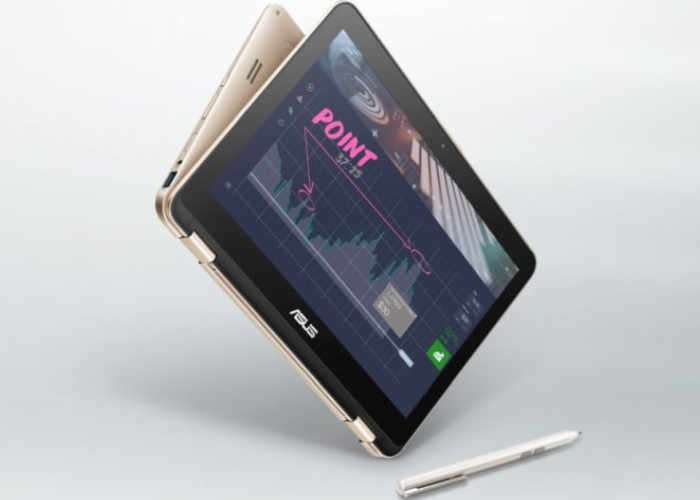 Asus have also provided support for their pressure sensitive Asus Pen stylus allowing you to sketch, draw and take notes directly on the screen. The Asus VivoBook Flip E12 E203NAIt supplied with options for either an Intel Celeron N3350 dual-core or Pentium N4200 quad-core processor which can be supported by either two or 4 GB of DDR3L-1600 memory. Asus has also made available to operating systems to choose from either Microsoft’s latest Windows 10 Home or the Linux-based Endless OS depending on your requirements. Other pictures of the convertible notebook include 32GB, 64GB, of 128GB of eMMC storage, connectivity via both 802.11ac WiFi and Bluetooth 4.1. As well as ports for USB 3.1 Type-C port, 2 x USB 3.1 Type-A ports, 1 x microSD card slot and an HDMI port. Asus has also equipped the convertible notebook with a 38 Wh battery and biometric fingerprint sensor for extra security. Unfortunately, no information on pricing or worldwide availability has been released as yet by Asus, but as soon as information comes to light we will keep you updated as always.